From the Agricultural Weather Center, in the University of Kentucky, College of Agriculture, Biosystems & Agricultural Engineering Department... here is your Ag Weather Synopsis for Kentucky compiled by Meteorologist Matt Dixon and Research & Extension Agricultural Meteorologist and Director of the UK Ag Weather Center, Tom Priddy ... To send us questions/comments, click here! Current Weather Related Press Releases here. 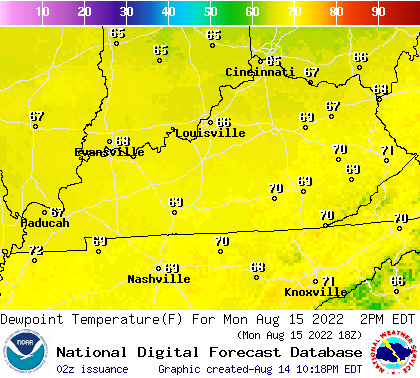 Across Kentucky...temperatures are near 64 degrees west, near 79 degrees central, and near 81 degrees east. Current sky conditions are light rain west, fair central, and fair east. 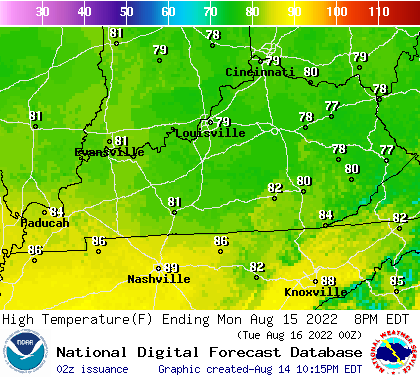 In the west, relative humidity is near 90%, and the dew point is near 61 degrees. In the central part of the state, relative humidity is near 40%, and the dew point is near 53 degrees. In the east, relative humidity is near 30%, and the dew point is near 47 degrees. Current drying conditions are poor west, good central, and very good east. 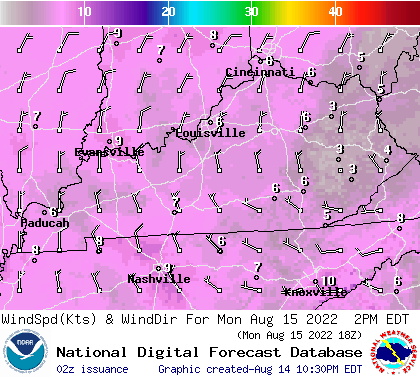 Winds are from the southwest at 9 mph west, where conditions are not favorable for spraying due to light rain. Winds are from the south at 12 mph with gusts at 24 mph central, where conditions are not favorable for spraying due to strong winds. Winds are from the south at 12 mph with gusts at 21 mph east, where conditions are not favorable for spraying due to strong winds. 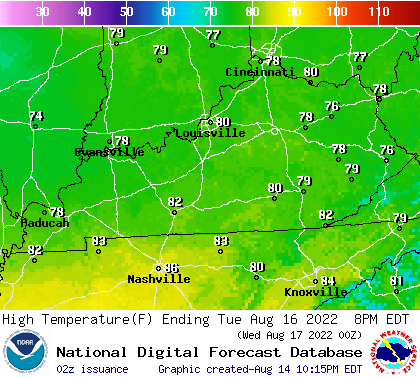 Based on current available observations, the highest temperature is 81 degrees at Jackson. 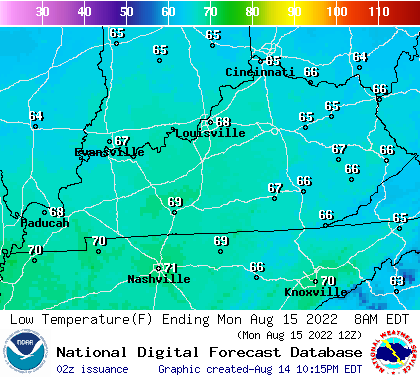 The lowest temperature is 63 degrees at Owensboro and Henderson. Click here for the entire list of ag. weather observations across Kentucky. [MP3] here. The UK PointAgCast is available for Kentucky and the entire nation here! click for West, Central or East for the 7-day text forecast. Or next 48 hrs here. Click here to see the forecast locations for rain, snow and a winter mix in Kentucky. 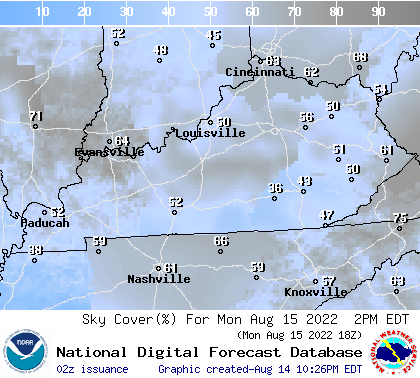 Click here to see the forecast temperatures for Kentucky. More KY Climate Info, PointAgCast, Mobile.